Miquel A. Pericàs was born in Palma de Mallorca (Spain) in 1951. He studied Chemical Engineering at the Institut Químic de Sarrià and Chemistry at the University of Barcelona, and obtained his PhD degree in 1979 for his work on acetylene diethers and synthesis of oxocarbons under the guidance of the late Prof. Fèlix Serratosa at the University of Barcelona. 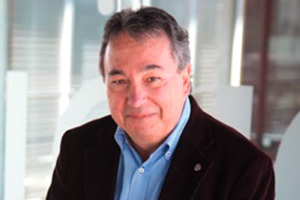 After postdoctoral studies at the Spanish Research Council (CSIC) with Prof. Francesc Camps, he joined the Department of Organic Chemistry of the University of Barcelona in 1980 as an Associate Professor. Since 1991 he has been a Full Professor of Organic Chemistry at that institution. The research of Miquel A. Pericàs has been characterized by the use of a combined theoretical-experimental approach for the study of chemical problems in the fields of organic and organometallic chemistry. His major research interests are currently focused on: a) enantioselective catalysis with catalytic species immobilized on polymers and magnetic manoparticles, with the goal of developing flow processes for the continuous production of enantiomerically pure compounds, b) the development of complex catalytic systems with enzyme-like behavior, and c) the development of metallic complexes of tris(triazolyl)methanes for catalytic applications. Miquel A. Pericàs has authored or co-authored some 265 scientific publications and 25 patents. In 2000, he was a recipient of the Distinció de la Generalitat de Catalunya per a la Promoció de la Recerca Universitària award, in 2001 he received the Janssen-Cylag award of the Spanish Royal Society of Chemistry for research in organic chemistry and, in 2005, the Narcís Monturiol Medal of Generalitat de Catalunya for Scientific and Technological Merits. In June 2000, he was appointed as Director of ICIQ. At the instructions of the Board of Trustees, he defines the main guidelines for the ICIQ’s science policy, takes the initiative with regard to the Institute’s strategic projects and, along with the Scientific Advisory Council, is responsible for selecting and evaluating the ICIQ’s scientific team. He is moreover responsible for overseeing the ICIQ’s relationships with government bodies, institutions and the different business sectors.